“To deliver 100% you need to share 120%.” That’s the motto inscribed on one of Nendo’s designs for garage-kit and model manufacturer Kaiyodo’s new collection of capsule figurines. 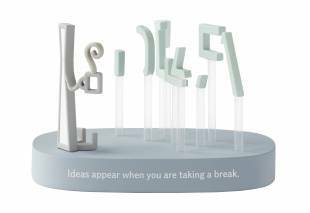 It’s a sentiment that Nendo itself appears to have taken to heart by sharing design advice in the form of tiny figurines. Kaiyodo has been making collectors’ models since the 1960s and has miniaturized everything from manga characters and famous artworks to animals and everyday objects. It’s particularly well-known for the small blind-box toys that can be bought from Japan’s popular gachapon coin-operated vending machines, which are onomatopoeically named after the sound the dispenser makes when delivering its trinkets. 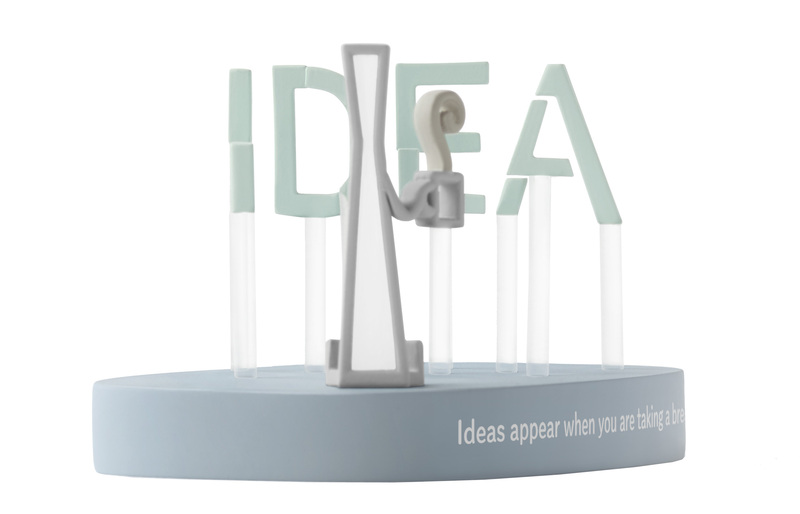 Since Kaiyodo is famous for producing detailed models of all kinds of physical objects, Nendo decided to design three-dimensional versions of something intangible: the conceptual design process. Intended to inspire creativity and spark ideas, each of the resulting set of figures depicts a cute stick-like character acting out different dicta. Most also reveal an alternative image when viewed from another angle. The Kaiyado figures will be released in May, but like the whole gachapon concept, it’s still a mystery where you’ll find them. Keep an eye out at toy stores. 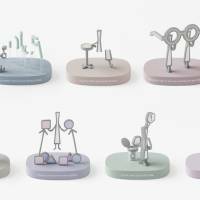 Though not planned for sale, Nendo has also released information about an idea that it will showcase at next month’s Milan Salone 2018 as part of its “Nendo: Forms of Movement” exhibition. Variations of Time is a series of four hourglasses that divide, double, split and convert time by replacing the usually uniform bulbs with various curvaceous asymmetric cavities. Carved in acrylic with interiors hand polished until gleaming, these ice-like forms house colored sand that trickles through the shapes at different speeds. One shifts its sand in one minute one way up, but does it in two minutes when flipped over, while another uses its sand to time one minute via its first chamber and then two minutes via another below. The two most dramatic versions split pools of sand to drain at different rates simultaneously. 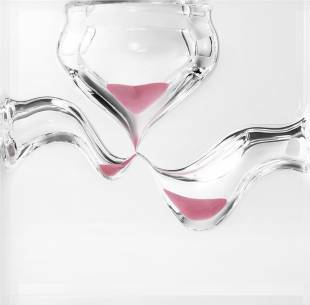 A wine-glass like basin divides a large pool of sand into two other chambers, timing two minutes on one side and three minutes on the other, while the three whirl-pool-like cavities of the last hourglass times one minute, two minutes and three minutes. If you happen to be in Milan from April 17 to 22, you can see Variations of Time in action at Superstudio Piu Art Point. Keep an eye on the website for more information. 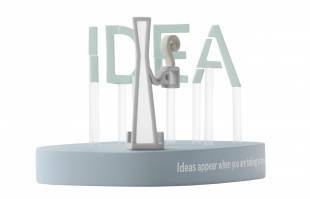 Perrocaliente from 100 Percent Inc. has refashioned the sundial into a minimalist art object by making one out of transparent acrylic. 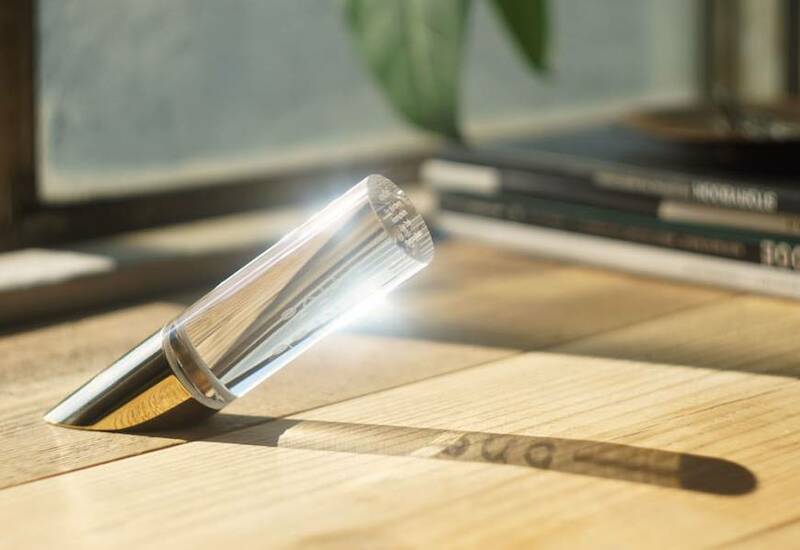 Though that sounds counterintuitive, the Undial’s clear cylindrical gnomon purposely allows sunlight through to cast a shadow that actually spells out the hour of the day. It does this via inscriptions of each hour of the day, which are engraved lengthwise along the gnomon. Each number also has a line above it to indicate how far into that hour it is. This means that the Undial doesn’t need a dial plate, so it’s also easy to move around when looking for the best position to catch the sun. There are five types set at various angles for different latitudes of the world — from 20-30 degrees to 60-70 degrees — with three that can be used in Japan: type 25 for Okinawa, 35 for Honshu and 45 for Hokkaido. 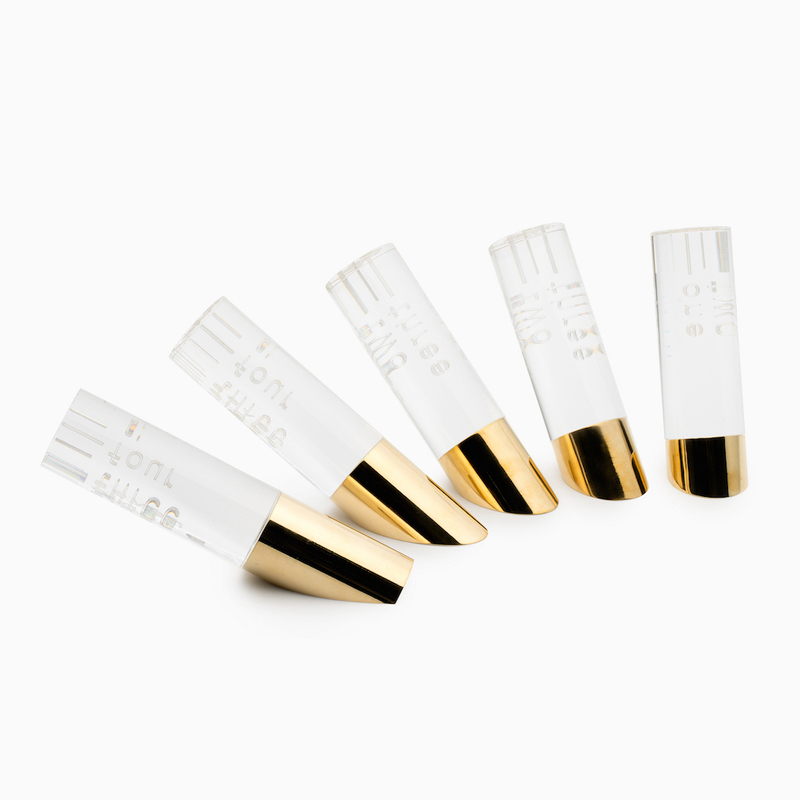 All are set on bases of either brushed or polished brass or stainless steel, are priced at ¥4,320 and currently exclusive to Spiral Market in Tokyo’s Aoyama district. Perrocaliente notes that the Undial can only give you a rough indication of time and that it’s more of an attractive novelty, but that doesn’t make it less innovative. Like the fleeting sakura (cherry blossom) season, Nousaku’s spring-inspired lineup of tinware will only be available for a limited time. Nousaku, a company dating back to the 17th century, recently gained fans for its contemporary collection of elegant hand-cast wind chimes and interior goods made of pliable tin. 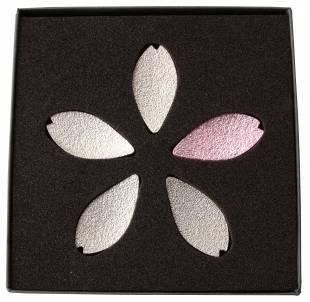 Almost all of its products feature the natural color of metal as a focal point, making the hand-applied pink gilt foil of this range unusual. The color is used subtly — lining tin sake cups and highlighting a single sakura-petal chopstick rest in a set of five — allowing the pieces to match other cherry-blossom themed items, which include the pictured small flexible sakura-shaped tray. 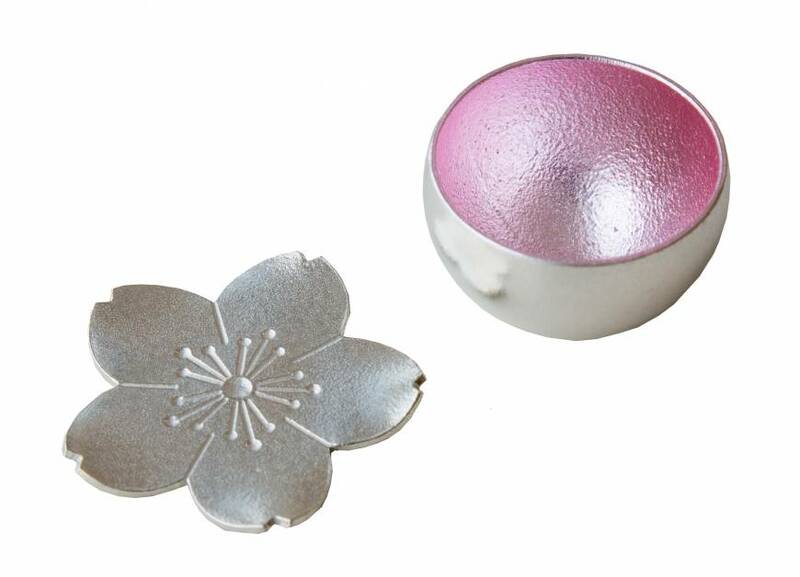 Prices range from ¥4,320 for the chopstick rests to ¥15,012 for a Sakura Set of two kinds of cups, two chopstick rests and a pitcher — but be quick, because the season may end soon.